Member of the European Parliament Gilles Pargneaux has commended the legal opinion issued lately by the European Court’s top advisor on EU-Morocco agricultural deal, saying that “it is time to shelve and put an end to a case which poisons relations with an important partner like Morocco”. Last December, EU-Morocco ties were strained after the bloc’s second highest court, the General Court, challenged EU-Morocco trade agreement and a 2012 deal to liberalize agricultural and fishery trade, following a complaint lodged by the Algerian-backed polisario front. The European Union’s top court should dismiss the polisario front’s complaint filed against several EU-Morocco trade agreements, said on Tuesday ECJ Advocate-General Melchior Wathelet. In the opinion of this former Belgian Justice Minister, the polisario front is not a legitimate organization and cannot contest the trade agreements. The opinions of advocate generals are followed in the majority of cases by the court. A final ruling is expected in three to six months. For MEP Gilles Pargneaux, the ECJ advocate general stand and expressed views are good news, calling on the EU to focus on strengthening cooperation ties with a key regional partner. “Security cooperation, intelligence sharing, economic partnership, energy cooperation and fight against climate change should be the driving forces of our joint projects with Morocco,” stressed Mr. Gilles Pargneaux. According to observers, the ECJ Advocate-General’s opinion will weigh in favor of Morocco and of the European Council, which had appealed the court’s first ruling. 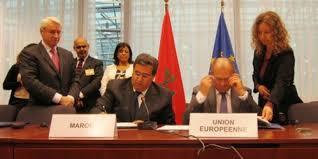 The appeal was backed by influential countries within the bloc such as France, Spain, Portugal, Belgium and Germany. The 2012 trade deal lowered tariffs on dozens of Moroccan agricultural exports to the EU in exchange for scrapping of tariffs on some European exports to the North African country. The agreement was part of EU efforts to encourage democratic reforms in the region following the Arab Spring uprisings of 2011.The EU has extensive ties with Morocco on trade, political and security matters. Many analysts believe the EU will overcome current legal hurdle and sort out European court ruling to preserve its strategic interests with the North African country. Morocco plays a key role in the fight against terrorism and has helped France identify and locate the mastermind of the Paris terror attacks last year. The North African country also helps Spain, Belgium, Italy and other countries in the fight against terror cells and extremist groups threatening European security. Written by: Jaber Ali on September 15, 2016. Posted by Jaber Ali on Sep 15 2016. Filed under Headlines, World News. You can follow any responses to this entry through the RSS 2.0. Both comments and pings are currently closed.